Abstract: There are many MP3 players fall into two categories, high capacity harddrive-based storage and low capacity flash-based storage. There are many MP3 players out on the market to choose from. Generally these portable music players fall into two categories, high capacity harddrive-based storage and low capacity flash-based storage. 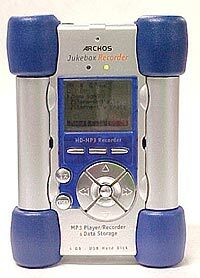 The Archos Jukebox 3000 MP3 player definitely falls into the high capacity category. With 6.0 Gigs of space it will easily store anyone's MP3 collection, and a whole lot more. The Archos Jukebox comes with Musicmatch Software, an A/C adapter, earphones, USB cable, RCA cables and a really neat carry pouch. The instruction book comes in several different languages. The Jukebox features jacks for Line out, Digital line out, Earphone jacks, full size USB port and a Mic in. The buttons a have a nice reassuring click to them when pressed. The fit and feel of the player is really solid. The screen is packed full of information and is backlit along the lines of a cell phone. Each of the four corners of the player are rubber for shock absorption and the rest of the body is made of aluminum and plastic. Trying to download MP3 tracks to the player first requires the host computer to recognize it as a removable hard drive. Installation of the drivers was easy enough, but when connecting the USB cords the order in which you plug them in seems to be important. I had a problem with the USB connection at the player as it was loose and any jiggling of the cable or player would reset the player. This would either lock up my computer or cancel any transfer ongoing media transfer. Once I got some MP3s onto it though , the player really able to shine though. One important issue to consider is that the Archos Jukebox Recorder only takes MP3s and does not recognize any other digital music format. The firmware is upgradeable however so this could be resolved in the future. There are a lot of menu options that help control the hard drive itself, the playback of music and other environmental and operational options. 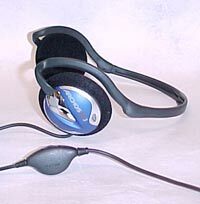 The sound quality was excellent using the included earphones. The display has two neat bars (left and right audio levels) that act like a graphic equalizer during playback - it is good for effect more than anything. 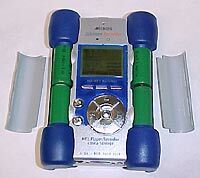 The best feature is the ability of the player to record MP3's in the field. 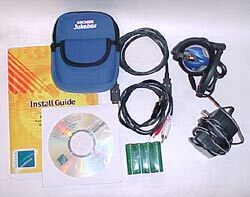 Plug a mic in or any other audio source and you could record hours of songs or conversations in real time, without the need for a computer! This Jukebox is a bootleggers dream. Digital recording with 6Gigs of space is more than enough for any concert. You could also hook it up to your stereo and record your CDs onto it for extra long road trips. The batteries are listed at about 8 hours of continuous use. 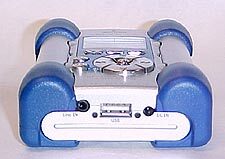 The Jukebox uses 4 Ni-Mh AA size batteries and comes with a spare set which can be dropped in when the first run out during a long road trip or something similar. The A/C adapter recharges the batteries when its plugged in. One thing that's a bit disconcerting is the fact that the player's backlight stays on when recharging and has a tendency to feel warm. The battery compartment is almost impossible to find unless you read the instructions. Two small flaps have to be clicked out for access to the batteries, and the fit is a tight one. Overall I like this player for its compact size, fit and feel and many options. I would gladly go out and buy one. The only caveat is its heavy weight. Since the batteries and hard drive are all metal the unit is not really a pocket comfortable device. Sitting on top of the dashboard or in a bag ought to be good enough though.